A few weeks ago, Sarah Davis tweeted a picture of her rubber-gloved hand holding a gigantic grey scaly foot with claws like railroad stakes. The image went viral – collecting over 14,000 likes, close to 5,000 shares, and three news articles about it to date. Davis’ Twitter feed was flooded with questions. Was the claw a prop from the latest Jurassic Park movie? Was it from an actual dinosaur? Davis, a Ph.D. student at The University of Texas at Austin Jackson School of Geosciences, replied that it was no prop, and that it did indeed belong to a dinosaur – it just happened to be a dinosaur that is also considered a bird. The claw belonged to a male southern cassowary, a big, flightless bird native to Australia and New Guinea. 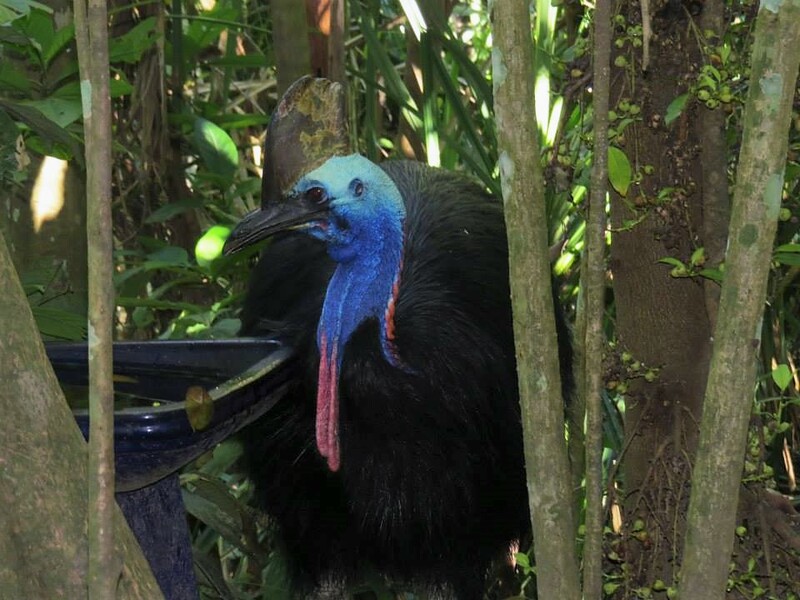 Like all birds, cassowaries are categorized as living dinosaurs because they are direct descendants of ancient dinosaurs that went extinct 66 million years ago. But that prehistoric connection is especially evident in the cassowary. Individuals reach up to six feet tall, rock coats of shaggy black feathers and sport an intimidating wedge-shaped crest atop their bald, lapis blue heads. And of course, there are those feet. Davis snapped her picture while dissecting the animal’s leg with other graduate students advised by Jackson School Professor Julia Clarke, whose research focuses on the evolution of the characteristic features of birds– including their feathers, flight and birdsong—and how they arose and evolved in extinct dinosaur ancestors. 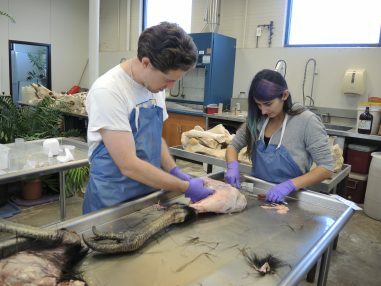 The cassowary specimen offered a unique opportunity for the group to examine a little-studied part of cassowary anatomy and build upon a body of anatomical knowledge that’s a critical source when making comparisons between modern birds and their dinosaur ancestors. “We had good reference points for looking at this animal and what we could learn from it, while also contributing to the scientific literature,” Davis said. But dead cassowaries aren’t easy to come by, especially in Central Texas. The reason that Davis and the rest of Clarke’s group were able to study the bird in the first place is due to the work of the Jackson School’s Texas Vertebrate Paleontology Collections – a storehouse for the bones of 17,000 and counting modern specimens that are kept with its fossil holdings of more than 250,000 cataloged specimens. 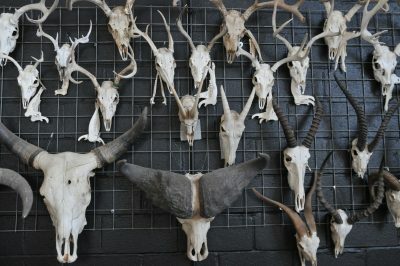 A selection of skulls from modern specimens in the osteology collections at the Jackson School’s Vertebrate Paleontology Laboratory. The earliest specimens were donated to collections in 1939 as part of the Works Progress Administration, which included a program that put people to work excavating and assembling fossils. The modern bones helped guide fossil reconstructions, some of which are now on display at the Texas Memorial Museum. Recognizing the importance of having a cache of contemporary specimens to compare with fossils, Jackson School Professor Emeritus Ernest Lundelius and his students, who were interested in identifying Ice Age cave fossils, led the expansion of the modern collection in the 1950s. 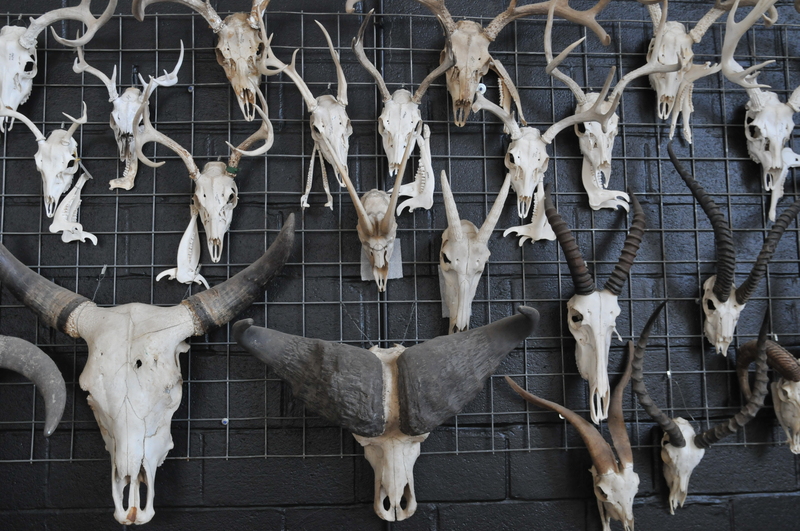 The effort often involved salvaging road-killed animals and the carcasses of predators like coyotes that ranchers had left hanging on their fences. “That’s the main purpose of our osteology collection, it was originally for comparison against fossils,” said Kenneth Bader, the osteology lab manger. Like Lundelius, Bader salvages specimens when he finds them. But rare and unusual specimens – like the cassowary – usually come from zoos and wildlife centers. A key part of Bader’s job is keeping relationships with zoos around the state so that when an animal passes away, he gets a call to salvage the carcass. Back at the lab, the specimens are either stored in freezers until scientists are ready to study them or go directly to the dermestids: flesh-eating beetles that clean the bones before they are ready to hit the collection shelves. Osteology lab manager Kenneth Bader (left) and research technician Sarah Hood with the leg of the cassowary. Credit: Sarah Davis. Even though paleontologists frequently rely on animals that exist today to learn about their long-extinct ancestors, it’s unusual for a paleontology lab to maintain a contemporary collection of bones, Bader said. Bones are usually the purview of biology departments, not geosciences schools. However, the Jackson School’s decision to gather bones alongside fossils not only helps researchers do their work, but breaks down the division between paleontology and biology. The term “paleobiology” – which is often used by the Jackson School and other geosciences programs to describe fossil research – helps communicate that the study of past life is directly relevant to understanding life that exists today, and vice versa. The cassowary is the perfect example. As a bird, it’s a member of the only living dinosaur lineage. Its intimidating toes are the closest thing we have to compare to the claws of non-avian dinosaurs that walked the Earth more than 66 million years ago. And thanks to the osteology collections, there’s a place at the Jackson School of Geosciences where scientists and students can see this connection both in the flesh and preserved as fossils.